The pretty little poppet with the camera is far more attractive than the RBE crew from the factory in Richmond/Maidstone. I guess she has been dispatched from Repco HQ in St Kilda Road to catch all the action. Which rather begs the question, what became of the footage missy captured? 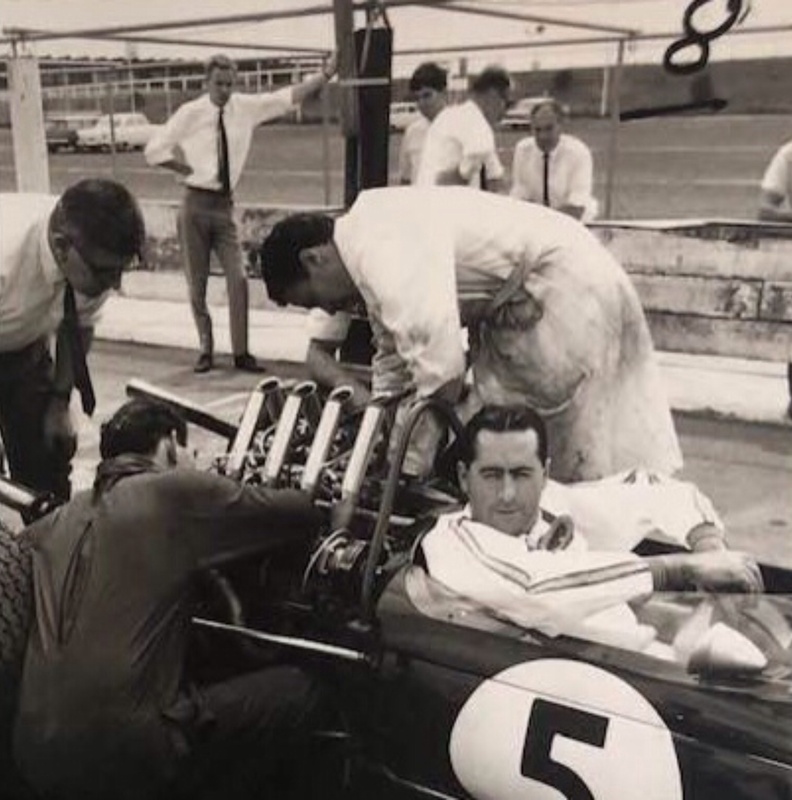 The car is powered by a new Repco Brabham Engines ‘620 Series’ 2.5 litre V8- the motor in 3 litre capacity made its race debut in South Africa on 1 January. BT19 was a very busy car in 1966 and well into 1967.
but these two photos were too good not to share. 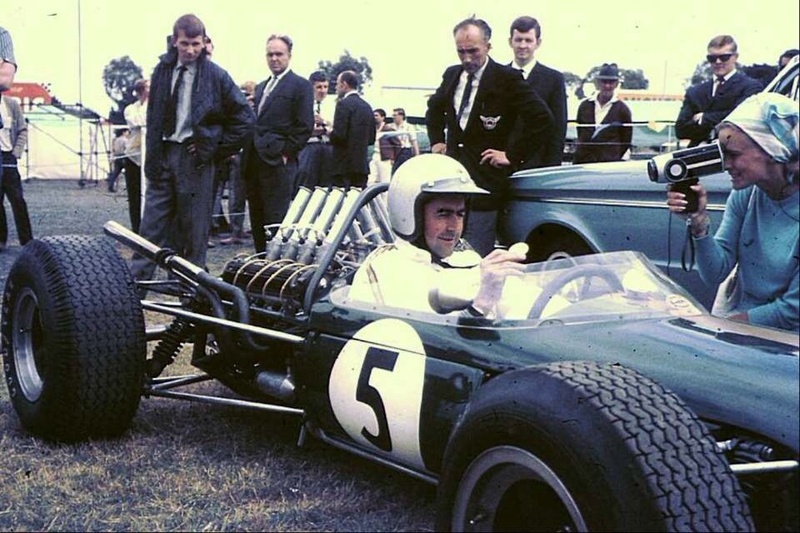 Jackie Stewart and Graham Hill created a BRM sandwich for Jim Clark that ‘Sandown Park Cup’ weekend- second in his Lotus 39 Coventry Climax FPF, the BRM lads were aboard 1.9 litre P60 V8 engined P261’s. Jack was out on lap 6 with a failed oil pump causing substantial engine destruction. 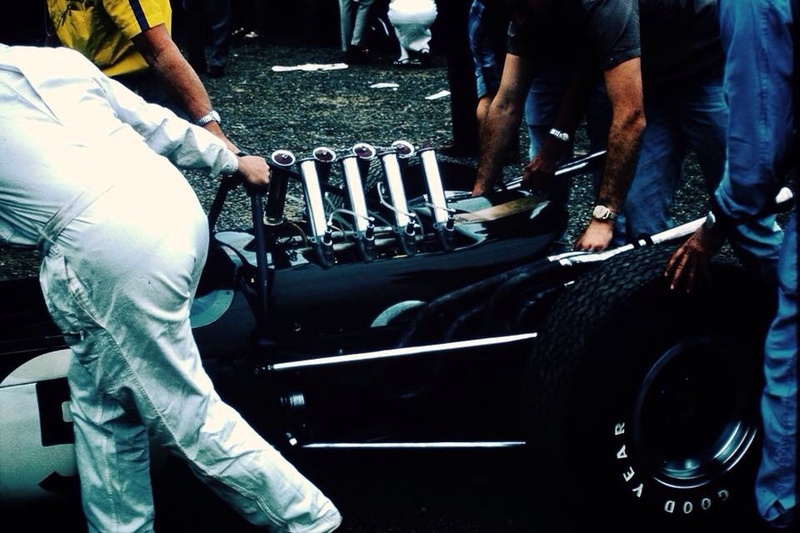 As is well known, the one and only Brabham BT19 ‘F1-1-65’ was built by Ron Tauranac in 1965 to suit the dimensions of the stillborn Coventry Climax FWMW 16 cylinder engine and lay unused until pressed into service as the first car into which the Repco RB620 V8, designed by Phil Irving, was installed. 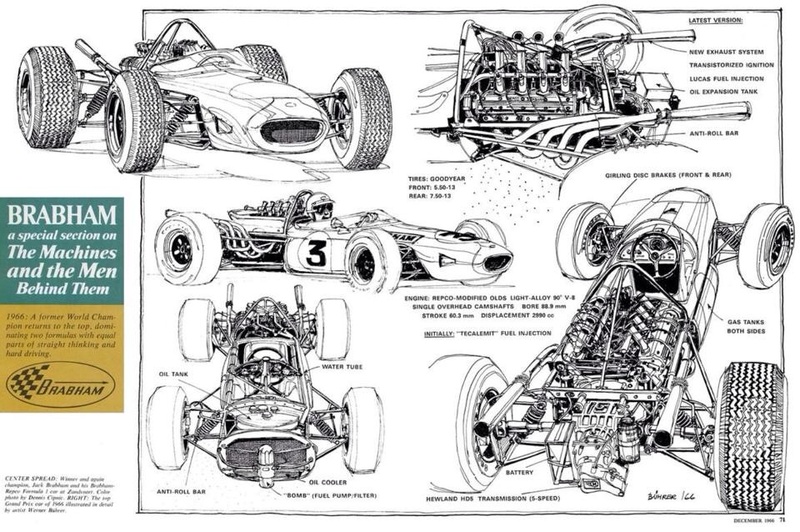 Utterly conventional in design, Jack put the light, chuckable car to rather good use throughout 1966- see Werner Buhrer’s outline and drawing of the car below. I’d actually finished this piece and then cruised through my archive and noticed how many other photographs I had of this particular weekend. 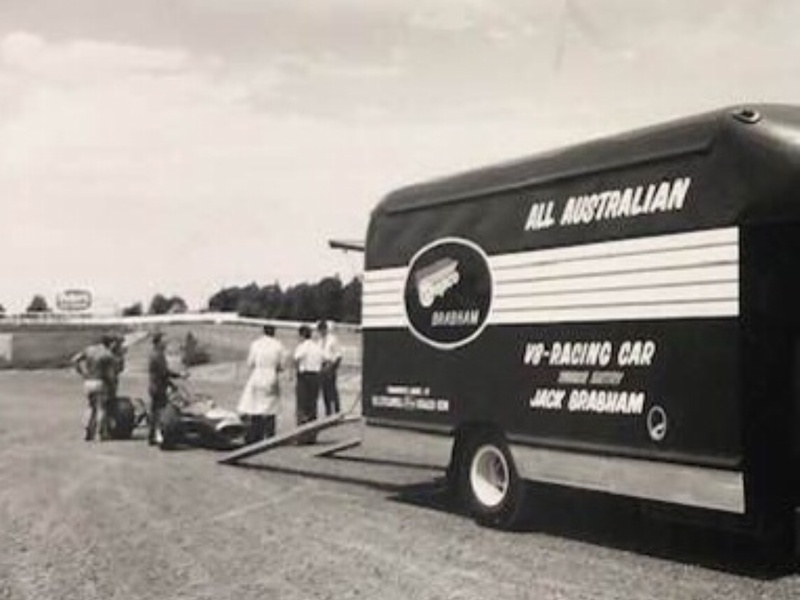 Some are only of ‘proof quality’ recently posted by Repco-Brabham engineer/racer/historian Nigel Tait, but they are still valuable to share to document RBE history. 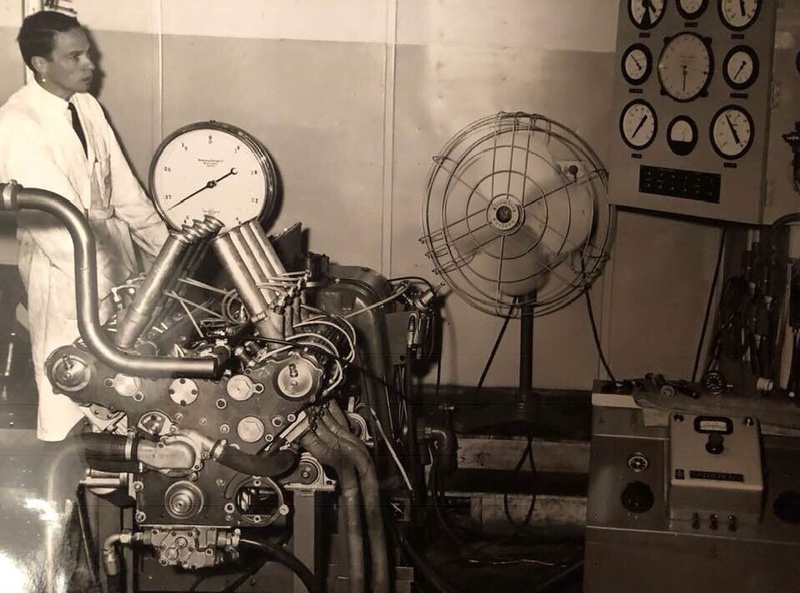 Mike Gasking giving an RBE620 2.5 a whirl in the Richmond test cells in late 1965- is it the engine in Jack’s car at Sandown?- more than likely it is ‘E2’ with those long inlet trumpets, yes. Gasking was in on the ground floor- he was apprenticed at Repco and was involved in building and testing Jack’s Coventry Climax FPF engines and then throughout the Repco Brabham Engines period to its end. Dyno is a Heenan & Froude GB4 which remained in Richmond for a while before being transported to RBE’s new digs at 87 Mitchell Street, Maidstone- this move took place in the early weeks of January 1966. Off she rolls from the truck, ‘Peters Corner’ and the start of the run up the back straight in the background. BT19 has been a busy already. 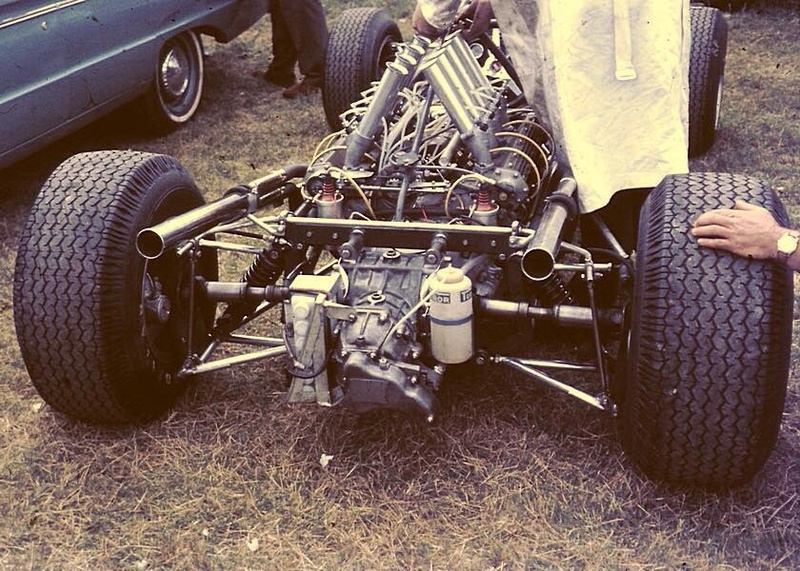 Fitted with a 3 litre RBE620 V8 the car was shipped to South Africa from the UK fitted with engine # ‘E3’ for the non-championship GP at Kyalami on 1 January. That SA GP was won by the works Lotus 33 Climax 2 litre FWMV of Mike Spence, Brabham retired when the fuel-injection pump seized having set pole and led for all but the last nine of the sixty laps. 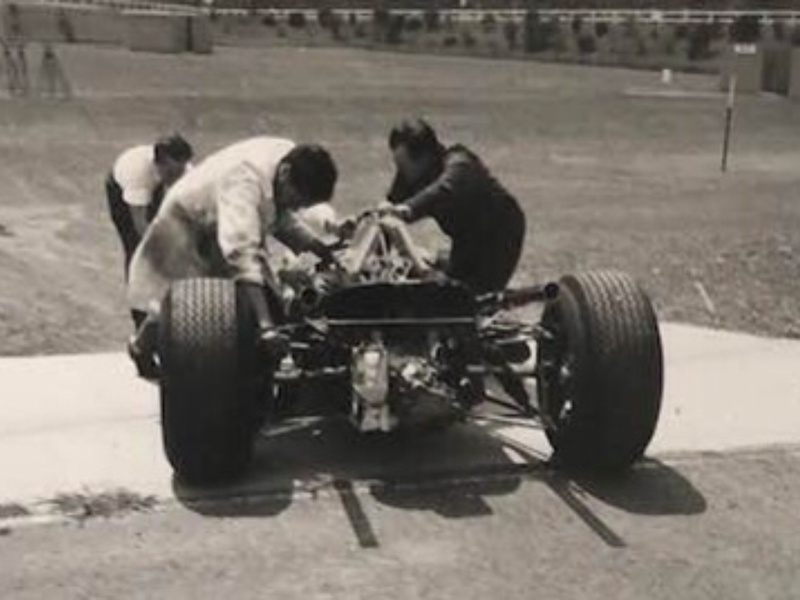 BT19 was then air freighted to Melbourne’s Essendon Airport and trucked to Richmond where the 3 litre ‘E3’ was removed and the 2.5 litre ‘E2’ installed for the Sandown. Many of you will recall Roy Billington, front and centre below, as a Brabham Racing Organisation mechanic for many years. All of Nigel Tait’s Christmases have come at once- he had just commenced at Repco as a graduate Cadet Engineer, his first assignment looking after Brabham’s new car- it does not get better than that at 22! Phil, leaning on the Lukey exhausts with ever-present fag in his mouth! Nigel Tait, Roy Billington and Phil Irving are fussing over ‘RBE620’ 2.5 ‘E2’ In the Sandown paddock on the Thursday or Friday prior to the meeting. 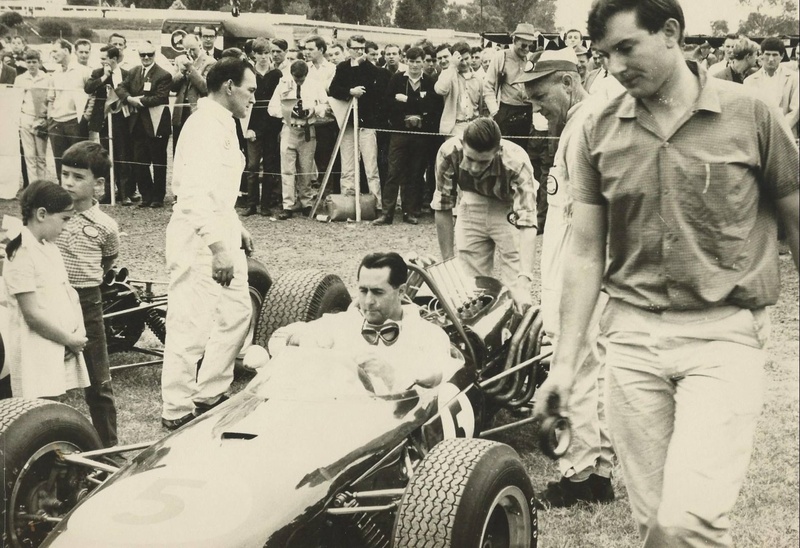 Plenty of pressure, it was the home teams first home race resulting in a massive crowd turnout of 55,000 people on raceday to see Brabham and his ‘all-Australian’ racing car make its local debut. Irving quotes over 250 bhp was given by the 620 2.5 litre- not much greater than the FPF but the V8 had good mid-range torque and could be revved past it’s power-peak without self-destruction, unlike the short-stroke FPF’s which tended to be rather brittle if over-revved by even a smidge. Frank Hallam now joins in the fun between the exhausts- left to right Hallam, Billington, Tait, the very obscured Irving and Black Jack. On the pit counter beyond is lanky Norman Wilson, Peter Holinger, a nun identified fellow and Bob Brown, a Repco Ltd Director. The sergent.com race report has it that the car was troublesome during practice, with 30 bhp being found overnight to put Jack right in amongst the front-running BRM’s of Stewart and Hill. Nigel recalls Phil getting cross with him on the race weekend , ‘We were working on the throttle slides on the BT19 the night before the Sandown meeting and it turned out to be a very long and late night. I went out to the all-night hamburger place and bought one for Phil but he spat it out. How was i to know he didnt like onions?- a great bloke and very clever’. Look at that crowd! Kidlets, Billington- who is the guy in the cap who always looked after Jack whilst he was in Oz and is in ‘all’ the shots?, Nigel Tait at right having cast aside his grotty lab-coat. At Sandown Jack set a new lap record in his heat, the Exide Cup- the results of two heats determined grid positions. The Tasman race engine seizure occurred in ‘…that the start of the race was delayed and everyone started with cold engines. The Repco V8’s oil-pump relief valve failed on the first lap (actually the sixth lap according to the various race reports) of the race the oil pressure went up to 160psi, the pump gears stripped and the engine locked up at about 7000 rpm’ according to Phil Irving. Tait recalls ‘That night…I had the task of removing the pump and dismantling it. Frank Hallam and his wife Norma were there as was Phil’. The oil pump gears were from a Fordson Major tractor out of an FM diesel model- they were amongst some components from proprietary vehicles used in RB620- which from that day were not sintered but machined from steel. ‘Frank Hallam arranged for new steel gears to be made while Roy Billington helped me to remove and dismantle the engine. We found two crankpins were badly overheated and the crank was bent, so the crank and the main bearings were replaced, but fortunately the pistons, rings and cylinder liners were undamaged. Although changing the crankshaft entailed almost completely dismantling the engine, the timing case and oil pump could be handled as units and we had the engine re-assembled with new pump gears and brake-tested by Tuesday afternoon. We stuck it in the car that night and it went off to Tasmania on the Wednesday (to Longford)…’ Phil wrote. 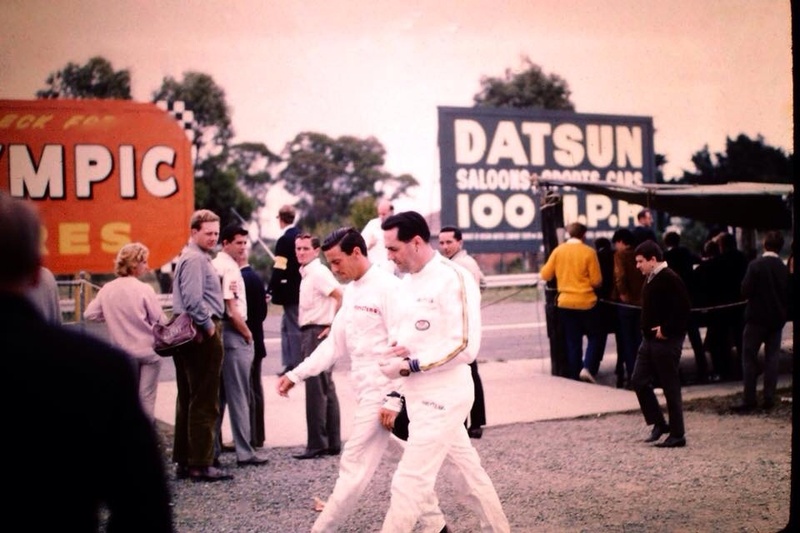 Jim Clark and Jack saunter through the Sandown paddock. Not the greatest of weekends for either! 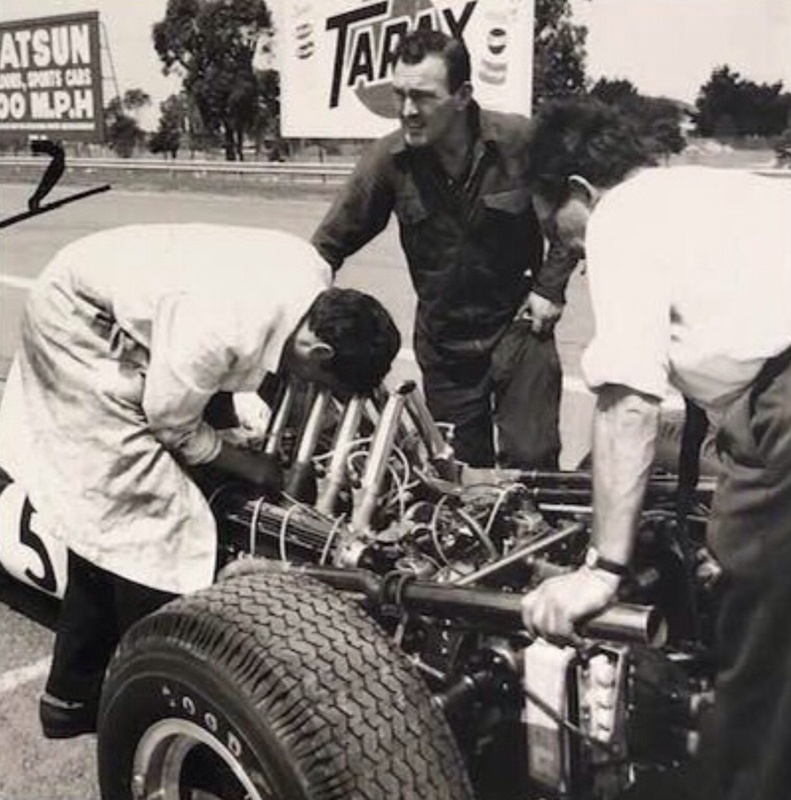 In Jim’s case the 2.5 litre Coventry Climax FPF engine in his Lotus 39- which had been the motor of choice in the Tasman series since its inception in 1964 was now being found wanting by the V8’s of BRM and Repco. Clark returned the following year with Lotus having taken a leaf out of BRM’s book- their 1967 weapon was a 1.5 litre F1 Lotus 33 fitted with a 2 litre Coventry Climax FWMV V8, with which Jim took the 1967 title convincingly from BRM and Repco Brabham. And again above…meanwhile below the boys are about to pop the car into the truck for the drive back to Richmond and overnight checks before the start of official practice.